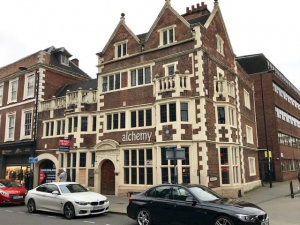 The 400-year old former home of a board game café will be one of the more striking lots to be sold at SDL Auctions Graham Penny’s first Derby auction of the year at Pride Park Stadium on Wednesday 13 February. A landmark building in Derby, Jacobean House, 33 Wardwick, dates back to the 17th century, when it was home to the wealthy Gisborne family. Part of it was demolished in 1855 to allow neighbouring Becket Street to be constructed. It has recently undergone refurbishment but retains many period features, including impressive fireplaces, exposed beams and panelling. The Grade II Listed building, which has a *guide price of £250,000+, is one of 52 lots to be auctioned at Pride Park Stadium. It comprises a trading area, bar, glass wash area and WCs on the ground floor. The first floor has a second trading area, bar, function room, terrace and WCs, while the second floor has a kitchen, staff accommodation and storage. In addition, there is a cellar and, outside, there are two parking spaces accessed from Becket Street. The property has existing A3 planning permission for food and drink use. Permission has previously been granted for change of use of the first, second and third floors to five apartments, although this has now lapsed. Staying in Derby city centre, 58 Green Lane, with a guide price of £50,000+, is a two-storey property with a ground floor retail unit and upper floor with planning permission for conversion to a two-bedroomed apartment. Currently, the first floor comprises two offices, a kitchen and WC. Green Lane is close to the planned £100m redevelopment of the former Debenhams site, with work due to start next year, providing a boost to this end of the city. A former social club, 32 Louden Street, Derby, is likely to appeal to investors and developers, as it comprises a bar area, several rooms, ladies’ and gents’ WCs and storage on the ground floor, with a spacious two-storey three-bedroomed apartment above. It occupies a quiet location opposite Derby Arboretum and has a guide price of £95,000+. Other retail units to be sold at the auction include 33 Market Street, Heanor, which has a guide price of £75,000+. It comprises a sales area on the ground floor, with two further storeys above which have the potential for conversion to residential or office accommodation subject to permission. For the small builder or developer, the opportunity to build a pair of two-bedroomed semi-detached houses can be found adjacent to 19 New Lane, Hilcote, which has planning permission in place. The plot is one of several to be auctioned on the day and has a guide price of £65,000+. Andrew Parker added: “From the splendour of a property such as Jacobean House to the blank canvas of a building plot, the auction room is a great place to find a project for 2019 and we are launching the new auction year with an extensive selection of commercial properties, development land and much more. The full range of 187 properties is featured in a bumper new East Midlands catalogue, which covers three days of auctions in Leicester, Derby and Nottingham, as well as 69 properties being sold online. To view any of them, or to bid online on any of the lots on Wednesday 13 February, click here. * Each property is subject to a Reserve Price which may be different from the Guide Price. For full definitions see www.sdlauctions.co.uk/glossary.